Without a doubt it's a remarkable stadium. 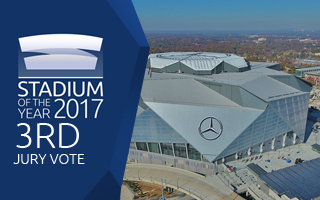 Mercedes-Benz Stadium has a roof structure like no other, both the permanent and retractable parts, to name just the signature features. This couldn't be left unnoticed by our Jury. Each of the 5 architects we invited had a total of 10 points to award to each stadium, divided into three categories (4+4+2). Architectural value proved not to be the strongest suit, causing the biggest diversity in grades: from 1 to 4 points. “The complex moving roof is the key feature of this project. Ironically the deep, multi-layered structure required to support it creates an unnecessarily tall volume in the bowl and when the building is viewed in the city scape. The seating bowl is well designed and appears to pull spectators close to the action.” comments Nick Birmingham of Arup Associates. The imposing form wasn't left unnoticed by other members, too, even if it's not uncommon for NFL stadiums and in compliance with what was expected from HOK, its creators. In total the stadium has received 2.52 pts out of 4, on average, for architecture. MBS proved much more successful in terms of functionality, being one of only two stadiums to exceed average of 3 points out of 4 possible, with 3.04. We should note here that functionality wasn't judged in comparison to other stadiums, rather with regard to planned future use. The closing roof, video halo board, partly retractable stands and curtains enabling visual downsizing of the stadium proved valuable assets already in the first year in operation. Finally, in terms of innovation the stadium has received 1.56 pts out of 2 possible. It could have been higher, but the leaks and other issues with its innovative roof weren't left unnoticed, as mentioned by one of the jurors. 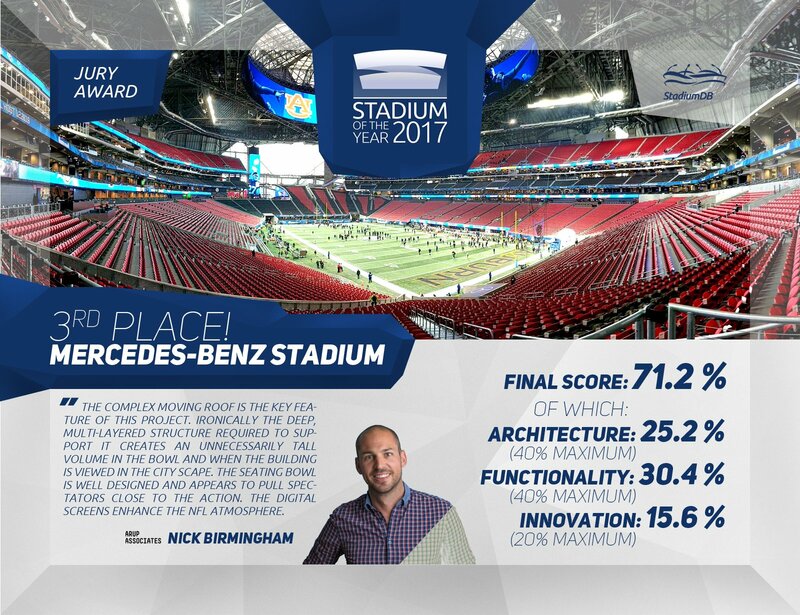 We should also note that Mercedes-Benz Stadium is one of just three in the entire final lineup to have received a note of 10/10 points from one juror. On the other hand, it was one of the least favourite for another person, due to the usual excess in American sports architecture, at least from a European perspective. Exactly why we always invite a diverse team of specialists!